“A GENUINE STORE WITH BETTER CUSTOMERS WILL ALWAYS BE IN A POSITION TO PROVIDE THE BEST DEAL”. 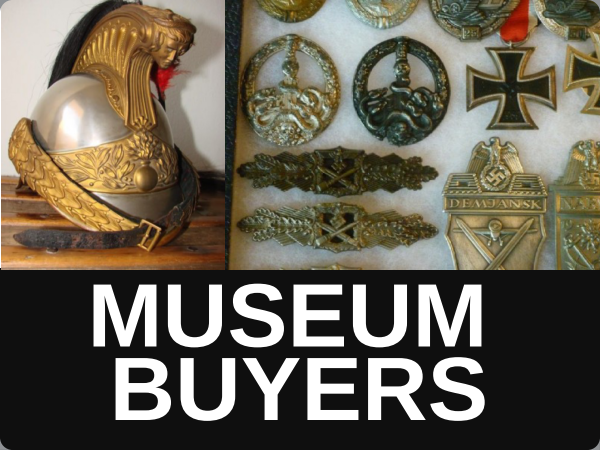 If you are considering approaching an auctioneers to sell militaria here are some important things to consider .. Auctioneers act as the agent between buyer and seller and take a significant slice of the pie (Commission) from both parties .Most items of militaria are not unique so it is quite possible to enter a search on your computer to find the Retail asking price for an identical or very similar item of War memorabilia . 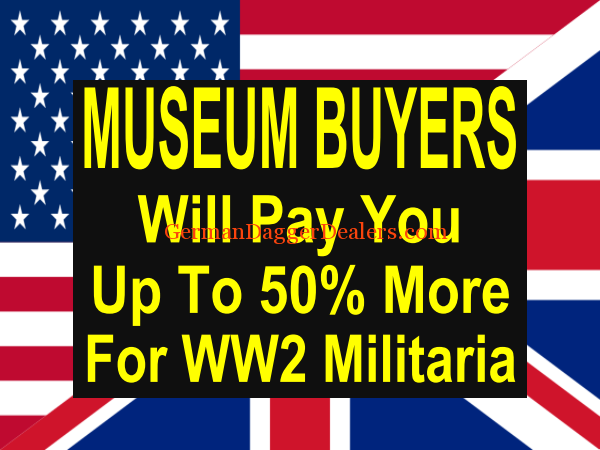 The question now is .”Do I really need to sacrifice 50% (The sum of both commissions in most cases ) to an auctioneers who is going to sell to somebody I can easily find online?. 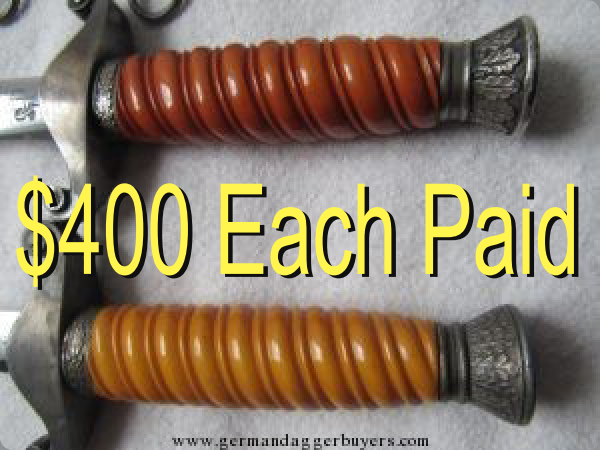 Already from what I have covered I hope you are now considering following a few basic steps towards directly marketing your family militaria .. Deceased estates require items to be sold at auction ..If you are alive and have been able to make contact with German Dagger Buyers you will be able to achieve the correct market value for what you have . 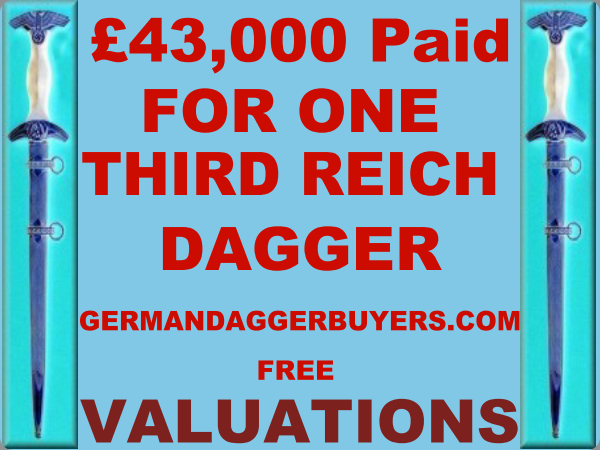 Four steps for obtaining the correct market value of your Militaria ..Step One ) Send a message to us at German Dagger Buyers.com containing a group image of what you have and your email address.. adding the word (Valuation/Offers) Step2) Repeat the process sending the same message to a couple of buyers chosen through the internet or shops . Step 3) Once you have satisfied yourself that you have been offered the correct price .accept the offer. Step 4 initiate the transaction once money shows to have been lodged in “Paypal” of whatever arrangement you opt for dispatch the items . By using this very obvious technique you will have avoided the losses assoviated with selling at auction.